Explanation: In celebration of tonight's Full Moon, the first of 2007, consider this grid of twenty Full Moons. 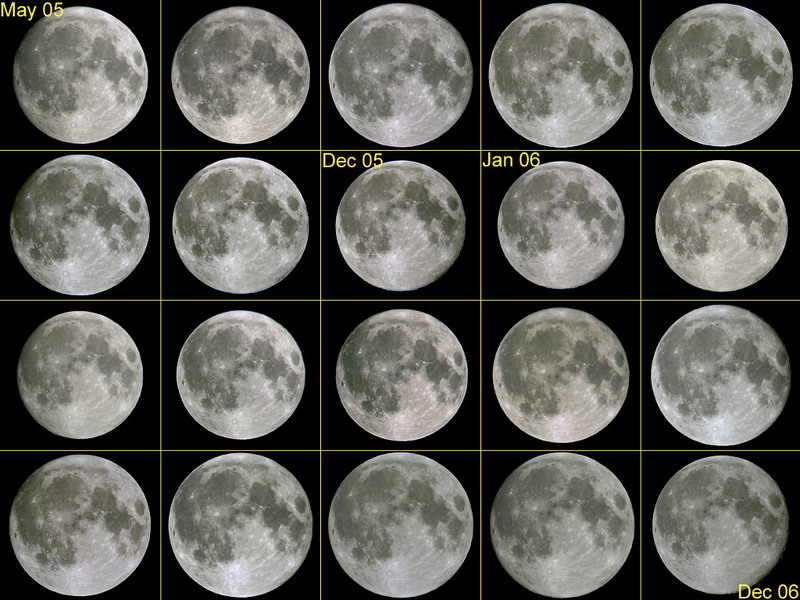 From upper left to lower right, the images represent every lunation from May 2005 through December 2006. The consecutive Full Moons are all shown at the same scale, so unlike the famous Moon Illusion the change in apparent size seen here is real. (For example, compare early and late 2006 Full Moons.) The change is caused by the variation in lunar distance due to the Moon's significantly non-circular orbit. A subtler change in appearance can also be noticed on close examination, as the Moon seems to wobble and rock slightly from one Full Moon to the next. This effect, known as libration, is more dramatic and easier to see in a twenty frame movie comparing these twenty Full Moons.